I found a really cool resource that is sure to be a hit with kids while also presenting a great opportunity to visually explore concepts like orbit, rotation and the solar system. 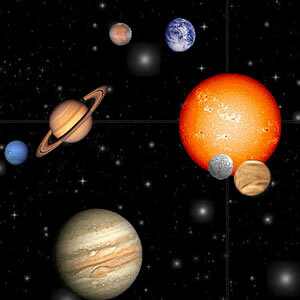 To operate the solar system, all you have to do activate the “sky” is place your mouse on the screen. I got the most natural looking results by placing my mouse on the Sun and then slowly moving my cursor along its outside edge. Placing your cursor outside the Sun up to about an inch exaggerates the motion further (smaller monitors require less, larger monitors require more). I’d tell you more about how it works, but half of the fun and most of the knowledge comes from figuring it out for yourself. While not an “official” NASA-approved representation of our universe, it does convey a sense of the vastness and complexity of our solar system. This cool tool is the result of a computer programmer named Will Jessup who created it simply to show off a bit of clever code he’d crafted. The second I saw it I realized that it could be used for educational purposes. One of my favorite things to do was to place my cursor at roughly 2:00 o’clock, right on the edge of the Sun. Then I’d watch Pluto disappear into the vast beyond and return from its incredible orbital path. Somehow my humble little computer monitor seemed to stretch for miles! Take a minute to play with this fascinating tool. I’ll bet you’ll like it. Take me to Will Jessup’s Planet Rotator script!